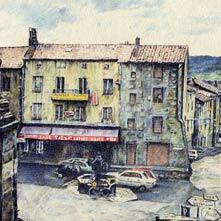 I headed off to the Auvergne, travelling east for a while. This was one part of the journey I had planned in detail. It was one of my favourite places in France. It is mountainous and green, there are picturesque villages and lovely architecture. It was quiet too, few people about and those I did pass, had a self-contained air about them, expressing only a mild interest in the outside world. Oddly the people in the flatter places had seemed more impressed by the cycling venture than those I came across in the harder, hillier regions.